Thurles is an ancient episcopal market town, where in 1174 Strongbow met his match at the hands of Donal O’Brien and Roderick O’Connor. The castle (12th century) guards the bridge over the Suir, and there is another smaller fort near the square. 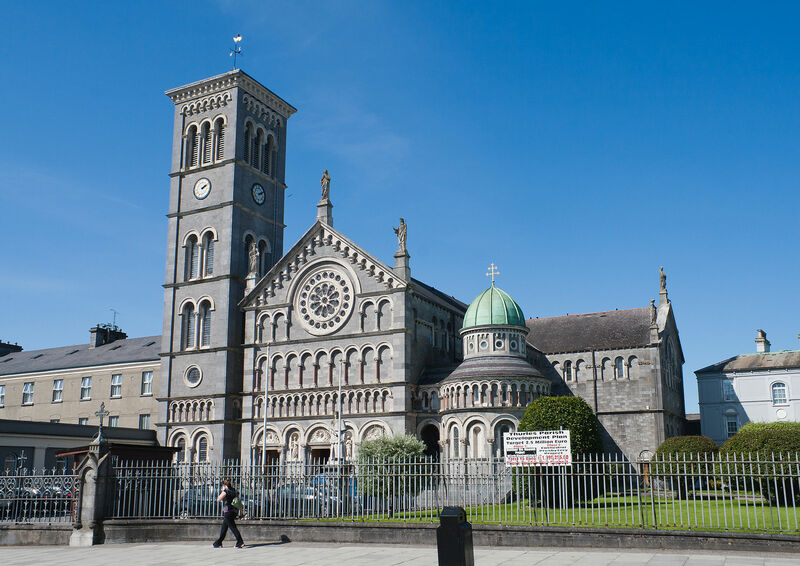 The handsome Cathedral of the Assumption in Lombardo Romanesque style (1865-72) by the ‘Gothicist’ J.J. McCarthy is the main architectural attraction and provides a strong contrast to the prevailing Gothic of the period. Inspired by the Duomo of Pisa, the polychrome façade has tiers of blind arcading and a rose window, with a campanile and circular baptistery flanking the façade. Internally the plan is basilican with a sustained use of coloured marbles, and an ambulatory connecting the aisles. The general effect is of the height being insufficient for the width of the building. It contains an original Baroque tabernacle from the Gesu in Rome by Giacomo della Porta (circa 1600), adapted for the setting. The square has an indifferent 1798 pikeman. In St Mary’s Church is the fine tomb of Edmund Archer and surgeon William Bradshaw VC by J.R. Kirk. The pretty Gothic Revival railway station is by Sancton Wood. North of the town is Brittas Castle, the remains of a moated medieval revival edifice with an impressive barbican tower by W.V. Morrison, on the site of an earlier fortress; its completion came to an abrupt half in 1834 when the owner was killed by a piece of falling masonry. Thurles is full of history that is a must see on your Ireland tours. Contact us now to organise your visit!